Reading this book is a win-win proposition. Consider how few books in the oversaturated occult marketplace address this topic—they simply aren’t necessary since Fortune did such a good job with this book. There’s little to add even though “four score and seven years” have passed. Because of her occult oaths, Fortune was constrained from revealing the techniques of highly-trained occultists. Nevertheless, this is a superb primary resource on the topic. This text is a companion book to The Secrets of Doctor Taverner, which offers case studies of various genuine psychic attacks presented in a fictional form. One might expect that the entire focus of the book is about self-defense methods, but the bulk of the book actually contains explanations of exactly who or what might be attacking. Without knowing the source and type of the attack, no decent defense can be mounted. A myriad of potential attackers are described, as well as symptoms of a genuine attack. Since these can include a mix of physical illnesses and “neurotic” symptoms, the investigator has to be clear about what’s happening to the purported victim. Fortune had extensive training in psychology and emphasizes that the investigator must distinguish between natural explanations (like tainted water or food), physical and mental illness, potential fraud (for sympathy, money, or a place to stay—no, couch surfing is not new), and genuine psychic attacks, which are very rare. The book is divided into four parts: I. Types of Psychic Attack, II. Differential Diagnosis, III. Diagnosis of a Psychic Attack, and IV. Methods of Defense Against Psychic Attack. Psychic attacks are for the most part based on some connection between the attacker and victim. The use of suggestion, hypnosis, and telepathic suggestion are examined. Alternate sources of attack can come from previous incarnations, disincarnate beings, artificial elementals, genuine elementals, and vampires. Her description of vampires is enlightening and refreshingly non-fictional. She also discusses the possibility of astral beings that may be released if a magical circle isn’t closed properly, as well as untoward energies emanating from haunted buildings, old churches, ancient temples and native religious sites. Fortune also explains the origins of evil entities that can cause obsession (power over) and possession (power within the victim). In the section on Differential Diagnosis, the author outlines the technical aspects of a magical attack. Besides the usual motives (greed, lust, malice) and opportunities of regular attacks, motives of a specifically occult nature are considered. For example, if a student or initiate leaves a guru/teacher, the guru may attack out of jealousy or anger. There can also be backlashes from breaking oaths taken during initiations into occult societies. Part IV gives numerous practical and occult remedies for attacks. Precise psychic and scientific methods of investigation to identify the cause and/or source of the attack are given. There is an excellent interview technique provided for the investigator seeking information from a victim. She advises giving minimal information to the victim because, as she points out, the “main object is a cure, not an explanation.” Following this section, in Chapter 17, Fortune finally gives what she calls a “first aid manual” rather than a treatise on treatment. There are four chapters offering different avenues of defense, and in spite of her minimalistic intentions, she covers these techniques in depth. Readers may find some bits in this book surprising. The author doesn’t think much of witches—in her mind, they’re linked with Black Magic. The reader should keep in mind that this book was written before Gardner’s establishment of Wicca. Fortune includes many references to Jesus Christ and various blessings and prayers that are quite obviously Christian. The author isn’t shy about revealing the abuses of Western occultism, which include “immorality, drug taking, and the bamboozling of silly women. Its worst faults are credulity, a slipshod scholarship that verges on illiteracy, and a widespread sappiness of intellect. Fortune-telling in all its forms and some very spurious spiritual healing constitute another slur upon what should be holy ground.” Few experienced practitioners will disagree with her assessment. The widespread dispersal of occult information without appropriate supervision and training can seriously endanger all of the participants. As the author points out, if you’re going to open a door, you’d better be able to close it, too. Anachronisms aside, this is a must-read book for anyone involved in ritual magic, occultism, or witchcraft. It will be a much-needed smack on the head for the “sappy” and “slipshod,” since it gives clear examples of the consequences of dabbling, consorting with dubious associates, and taking other peoples’ sincerity and expertise for granted (although without a doubt, these are the people least likely to read it). 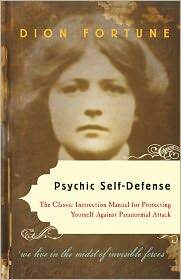 For methodical and conscientious practitioners, this book provides basic but thorough coverage of techniques and methods for psychic self-defense. Excellent book, highly recommended, required reading for anyone working with unseen planes and forces.